COMODO Mobile Security (CMS) is designed to protect your Android devices against viruses, unsafe apps, potentially risky settings and even from theft. Not only that, it helps to protect your privacy and keeps your system optimized. Why Comodo Antivirus for Android? Comodo offers exclusive mobile security solution for Android based mobile devices through its remarkable product, Antivirus for Android. 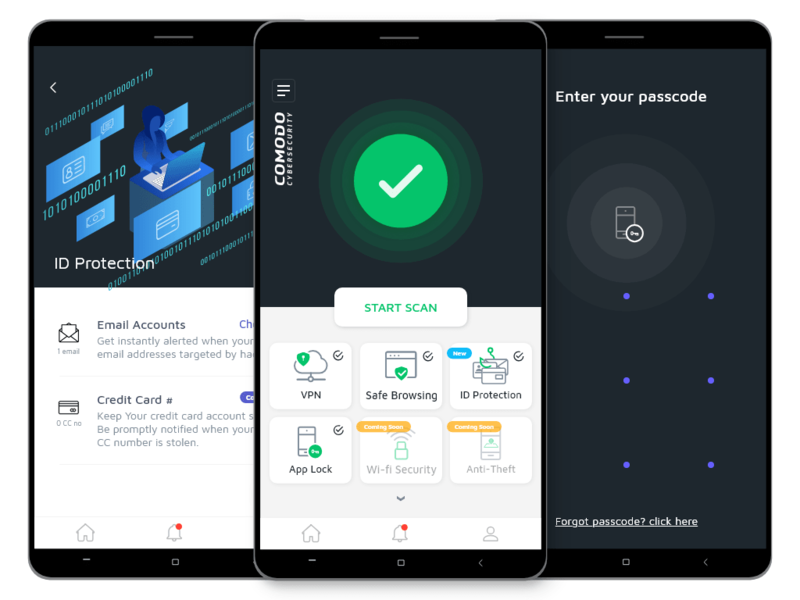 COMODO Mobile Security (CMS) is designed to protect your Android devices against viruses, unsafe apps, potentially risky settings and even from theft. The Android Antivirus from Comodo is a remarkable solution Mobile Antivirus that protects your privacy and keeps your system optimized. The Mobile Android antivirus helps to protect your personal information such as photos, contacts, etc., videos personal contacts and much more. Comodo's Mobile Antivirus offers a significant rate of detection of malicious mobile threats. Comodo Mobile Security restricts unauthorized calls, prevents the attack of ransomware, obstructs banking Trojans from accessing or stealing of your android device data. A perfect way for Mobile Security is through Comodo's Free Antivirus for Android. Anti theft is an important element of Mobile Security. It remotely recovers your device if it is mislaid, lost or stolen. The anti-theft feature enables you to get the location of your device even if its SIM card is changed. You can also make the device sound a loud alarm, take a photograph of the possessor, lock it to prevent unauthorized access and remotely wipe it of all your confidential data-including any files stored on your memory card. Now it's very simple to manage all the apps in your device. You can view the installed apps, take a backup or uninstall them. With a single tap restore uninstalled apps back to your device. Software Manager provides a full list of apps in your device and you can choose either to install them or delete them. Backup is one exclusive feature that a Mobile Antivirus should have. Let the fear of data loss from your android device be a thing of the past. CMS allows you to back up important data such as contact lists, text messages and private space to a memory card. You can also back up your CMS configuration as well as all the apps in your device. Restore backed up data instantly in case of data loss in your device. A slow responding device can be a most frustrating experience. This can be due to many processes running at the same time and many temporary files stored in cache memory. CMS gives you full visibility and control over running processes. You can see how many are running, how much memory each uses and can quickly close down the ones you don't want. Software Manager helps you kill apps which may be slowing down your phone down. Clean all the temporary files in cache memory with a single tap and see the performance improve immediately. Privacy Advisor identifies those apps on your device whose permissions could allow them to compromise your privacy or cost you money in outgoing calls/texts. It will tell you which apps are allowed to access data such as your contact lists and archived messages and which apps can make phone calls/send text messages. Don't worry about performing an Antivirus scan manually in your device anymore! The Task Scheduler feature in CMS allows you to automate the antivirus scanning process. You can choose to run the scan on any day or all days at a preset time. You can also set schedules for 'Enter Flight Mode' and 'Leave Flight Mode' on your device. Keep track of your mobile broadband usage in real-time. The Traffic Monitoring feature helps you avoid overage charges for exceeding the data limits on your plan. You can configure the application to provide alerts if your monthly traffic limit is approaching and/or set a daily traffic quota. You'll also get to see comprehensive details of all GPRS/3G data traffic and a chart of data usage for each running application. You can conserve your data usage by stopping or even uninstalling data-expensive applications. You can also use the Firewall from the traffic monitoring interface to block apps from ever connecting to the Internet. It gives the best security solution for my android device without affecting their normal operations.